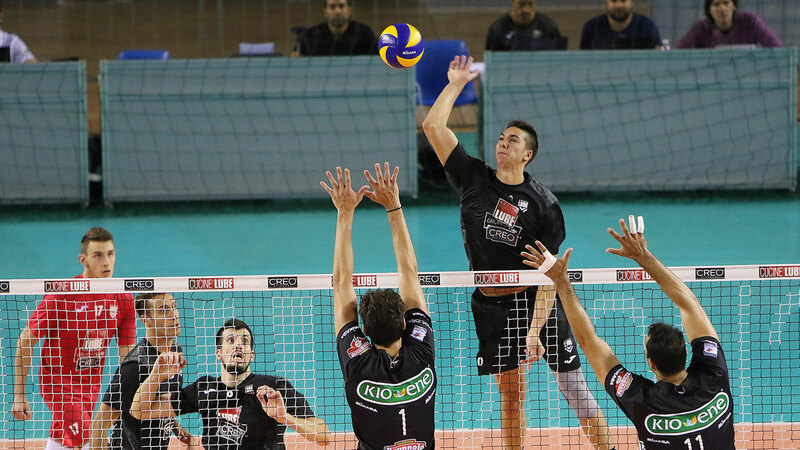 Lube Civitanova completed a pair of friendly matches against Kione Padova on Thursday and Friday this past week. They beat Padova 3-0 on Thursday and 3-1 on Friday. These were the last preseason friendly matches before the semifinals of the Italian SuperCoppa against Perugia on October 6th. Brenden Sander made his debut in a Lube jersey on Thursday. He was inserted into the lineup in the third set and finished with 2 points. He played in the third and fourth set of the match on Friday. Sander finished that match with 5 points on 4 kills and a 57% hitting percentage. Robertlandy Simon continued to lead the team in attack for Lube. After earning MVP honors at the “Hot Buttered” preseason tournament last weekend, he finished up the preseason with 19 points on Friday as the opposite. He is expected to play opposite until Tsvetan Sokolov makes his return from the knee surgery he had on June 4th. Fellow Cuban, Yoandry Leal, scored 13 points from the left side. Maurice Torres led Padova with 15 points on Friday. The opposite from Puerto Rico took part in the FIVB World Cup earlier in the month, and he is a new addition to the club from Zaksa in the Polish PlusLiga. Lube Civitanova is still awaiting the return of Bruno, Osmany Juantorena, and Enrico Cester. Those players are still representing their countries in the FIVB World Championships.